Eggplant and Pasta Turrets Eggplant Fest Continues! Spaghetti is an American classic. I don’t make it often enough, especially since going gluten free. That may change since I started to read Mario Batali’s newest cookbook “America Farm to Table”. 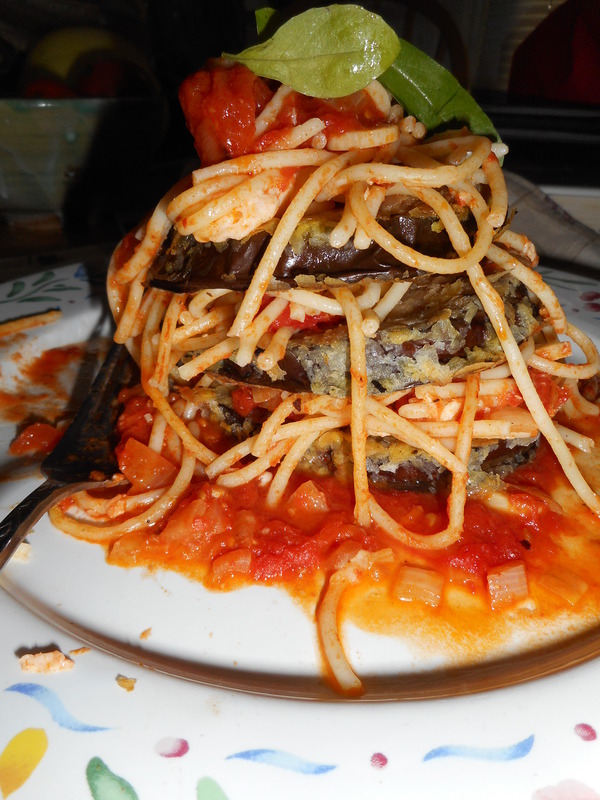 I cooked up a storm this past weekend making his eggplant and angel hair turrets. What’s a turret? A tower of yumminess! Having a surfeit of eggplants I was diving into all my eggplant recipes to determine the best way to utilize my crop of purple beauties. This one is a winner! We devoured it by candlelight on my back porch Saturday night, bees wax candles to be exact. I thought for a moment that my man was going to lick his dinner plate! It was rewarding to see him so enraptured by my cooking. I served it with a side of Italian sausage but it does stand alone as a complete entree. We had a greens and tomato salad to complete this wonderful meal. I took this picture by candlelight! I made a few changes so this is an adaptation of the recipe. I advise reading it through twice so you don’t screw it up! I used less red pepper flakes than the original recipe; up it to a tsp. if you dare! Yes, it uses instant potato flakes and they work fantastically to coat the eggplant slices. Don’t be squeamish about the anchovies; they totally disappear into this spicy but lush sauce that coats the pasta and provides a base for the tower. I used tomato sauce I had made the night before from the last fresh tomatoes as the base to build this extra spicy sauce which can hold its own with the eggplant headliner. This recipe serves 4. Eggplant: Place the eggs in a wide shallow bowl, beat well. Put the potato flakes into a second shallow bowl or a wax paper covered plate. Slice the eggplant into 1/3 inch slices. Dip into the eggs, let excess drip off and dredge in the potato flakes. Heat a large Teflon pan, add 2 tbsp EVOL. Let heat to medium hot, add the eggplant slices, cook 2-3 minutes a side. Place cooked eggplants on a paper towel lined plate. Do a second batch of slices. I put my cooked slices on a small baking sheet and put them into a 350 oven which I then turned off. They stayed hot and I felt a tad more sure that they were fully cooked. Make the sauce: heat the remaining EVOL in a large pot, add the onion, sauté until slightly softened; 2 minutes, add the sliced garlic, red pepper flakes, mashed up anchovy fillets, oil of fillets and the tomatoes. Cook, stirring often; 12-15 minutes. Pasta: Cook the pasta in a big pot of boiling salted water, I used Barilla by the way. Drain it one minute before the package directions say it will be done. Save a cup of the pot water to thin the pasta. Use the eggplant fry pan (wipe out the brown bits of crust) and ladle in 2-3 big scoops of the sauce and the pasta. Cook one minute, turn off the stove and add the cheese, stir well. Place a big spoonful of sauce on each plate. Top with an eggplant slice (I used my biggest slices for the bottom layer) and then top with a big twirl of the pasta mixture. 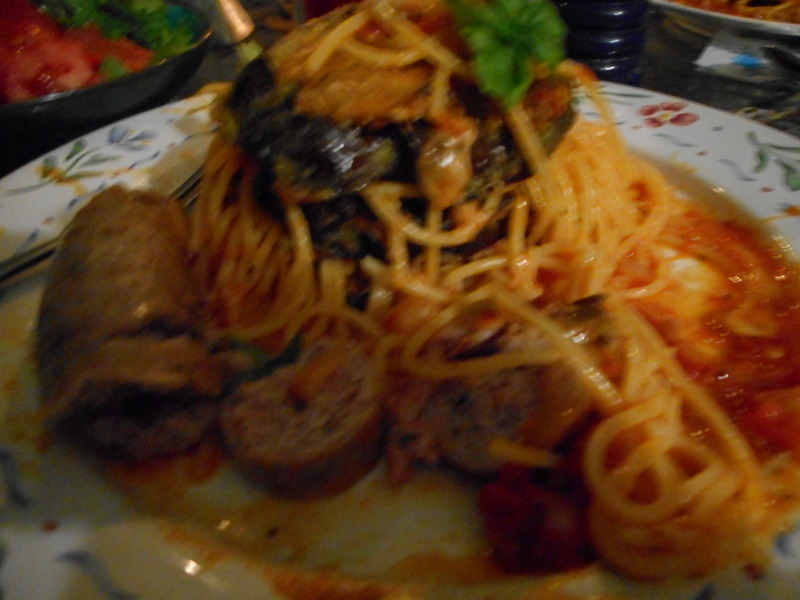 Top with another eggplant slice and then another pasta twirl. Do this again. Top with a dab of the red sauce. You can also top it with some red pepper jelly but I didn’t go there! I did sprinkle our towers with a few torn basil leaves. My towers were a tad sloppy Saturday but I made another one for Sunday lunch and that time I got the right amount of pasta between the eggplants and it looked amazing! Dive in to this wild but yummy dish! And check out this new cookbook; chock a block full of great relatively healthy recipes. This was one of the more complex ones; most seem fairly straight forward and sound darn delicious. Tomato time is right now. I love a home grown tomato, sliced with vinaigrette, or with a dab of light mayo on it. I love them inn a sandwich, a salad, Italian pasta dishes or as the major component of a tomato soup. There is a family recipe that is only made in the days of ripe local tomatoes. It is never ever worth making with a winter or green house tomato. Old varieties like Brandywine work great but any ripe tomato freshly picked and not chilled ever will work just fine. Use whatever kind of tomato you like. This sandwich is a man pleaser with bacon and cheese in it. 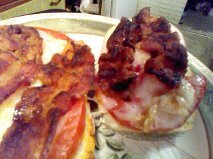 We call it the broiled tomato stacker or the BCT (Bacon Cheese and Tomato) You can call it fabulous and addictive! It has the triple whammy of bacon, cheddar cheese, and juicy summer tomatoes. Prepare to dive in and enjoy. There are only five ingredients. I make it with GF bread but you can use any bread of your choice. Do not use cheap or light cheese; I like Cabot Extra Sharp Cheddar but any good sharp cheddar will work. I never met a bacon lover who didn’t fall instantly for this sandwich. This recipe for 2 open face sandwiches as I tend to eat less bread GF and you can really taste the components without that second slice. If you want a top slice just double the bread. I used slices of zucchini yeast bread I made myself, recipe from Nicole Hunn, who authors the very popular Gluten Free on a Shoestring blog. It holds together well and has a great yeasty savory flavor. It is very easy to make and versatile. 2 slices raw bacon cut in half. Set your broiler to high to heat. Use a knife to spread the mayo on the two slices of bread. If you want a top slice I would leave that one un-spread and broil it briefly to brown one side. Place the mayo bread slices on a metal broiler sheet. Slice your tomato into slices that are about 1/3 inch thick with a serrated knife; not thin slices and cover the entire tops of the bread with it. I often cut a tomato in half or quarters to piece it so every centimeter is covered with juicy ripe tomato. Top with 2 slices of cheddar cheese, I cut them about ¼ inch thick. I use 3 slices of cheese if the bread slice is large. You want coverage over most of the tomato. It will spread some when it melts. Put the broiler pan in the broiler and broil 2-3 minutes until the cheese is melted but not burnt. Try not to overdo it as the cheese can run right off the tomatoes. Remove from oven and place on a plate. Top with the bacon slices. If you broiled a top slice of bread put it on now. Eat while hot but don’t burn your mouth on that melty gooey cheese! Yes, this recipe is not for a dieter and I imagine it is full of calories but also maximum flavor. I make it a lot during tomato season and reason that I never eat it any other time of the year so I don’t worry about the fat or calories I am chowing down in this flavor feast. Just make one and you will be hooked. I can’t wait to eat one for lunch tomorrow! Summer is tomato time around here. 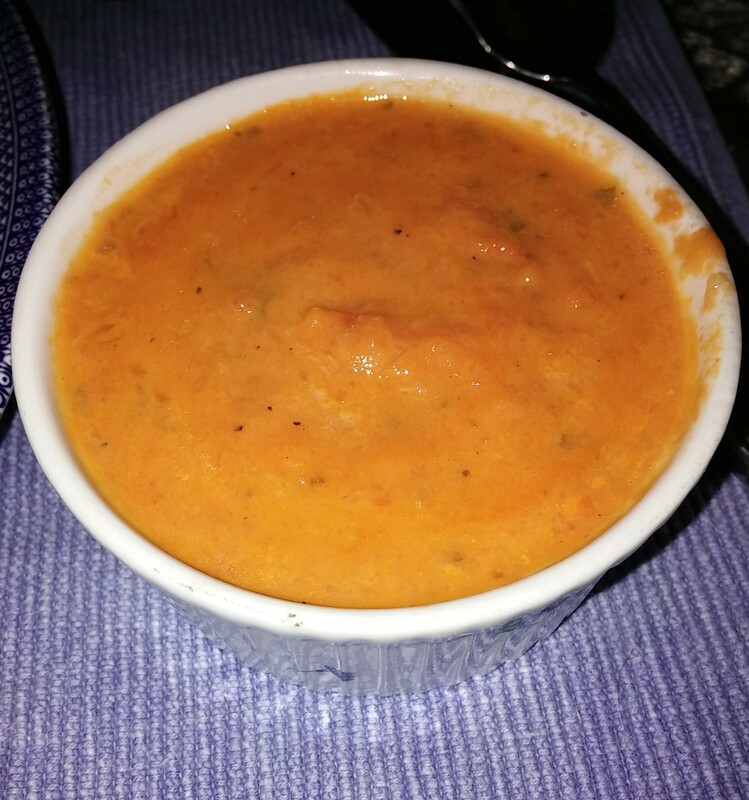 I had tomato salad tonight and for lunch I had homemade tomato soup, had it yesterday too. It is all gone but I am wishing I had another bowl in the fridge for tomorrow. 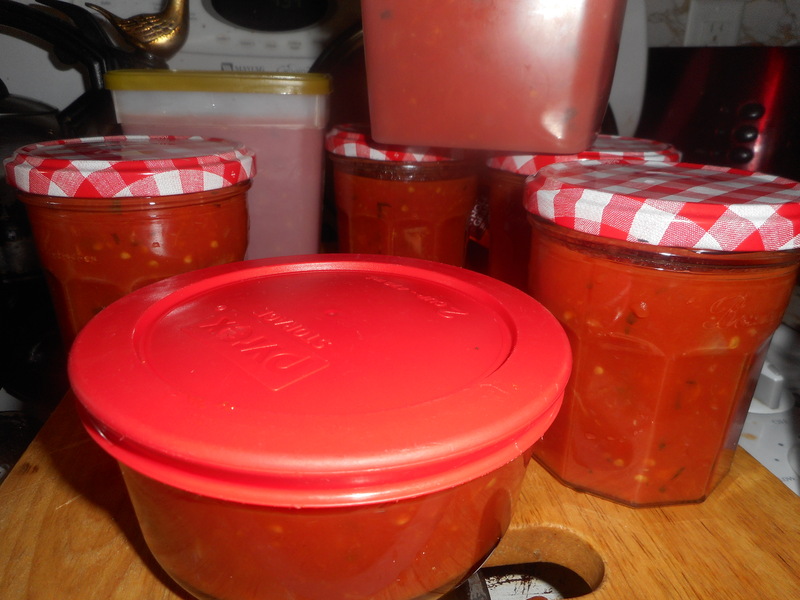 Last October I made a big batch and froze it in plastic containers, each two servings. I felt like I was back in a sunny summer day whenever I had it for lunch last winter. Add the cream to the soup and process it by blending with an immersion blender or run it through your food processor. I use my cute little boat motor blender and leave it chunky just as I love soup to be. Reheat the soup over low heat just until hot and serve plain or with julienned basil leaves and/or GF croutons. Enjoy! Tomatoes stuffed with salad, I know: very old school but I made a modern take on it the other week for company. A gluten free version I might add! Everyone raved about the fresh flavor of the dish. So I am posting it here so you can try it; one caveat; only use local tomatoes. Do NOT make this with those pale imitation supermarket tomatoes. It is not possible to create something tasty if you start with bad ingredients and those plastic flavored “tomatoes” just will not work. You can serve the filling as a side salad and I will give those directions after the tomato version. I served the salad style at a picnic last week and my sister Karen had seconds. She was not a big quinoa fan until she ate that salad! Using a sharp paring knife cut the top off of each tomato, reserve it for a lid. Scoop out the tomato guts using a spoon. I like to use a serrated edged grapefruit spoon but almost any spoon will work. You can use the insides for something else; in a soup, a salad or a stew? I turn the hollowed out tomatoes upside down to drain briefly to be sure I got all the wet stuff out. Place the cooled quinoa In a mixing bowl. Top it with the finely chopped veggies. You can use less veggies than I suggested; up to you. I like lots of veggies. Make sure they are cut very small though. Sprinkle the fresh herbs on top; even fresh chives chopped fine or basil will work great. 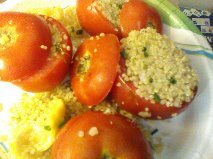 Use a zester or a very fine grater and get as much zest off the lemon (wash the lemon first); you can zest right into the quinoa mixing bowl. In a small mixing bowl put the juice of that same lemon, the EVOL and red wine vinegar. If you have more than 3 tbsp of lemon juice add a bit more EVOL and whisk to combine; add in up to ½ tsp salt and ¼ tsp freshly grated black pepper. Pour ¾ of it over the quinoa and veggies and stir to combine. Taste and adjust seasoning and add the rest of the dressing if it is needed. Use a large spoon to fill the hollowed out tomatoes. Top each one with the reserved lids. I put mine finished tomatoes on a platter and refrigerated for a few minutes so I could make the rest of the meal; no more than 1 hour. You can serve each on a bed of lettuce or just by itself. This is a great side dish or, if you have a vegetarian visiting, it is a substantial main dish choice as quinoa has a lot of complete protein in it. I served it with some zucchini yeast bread and some gnudi dumplings as a delicious meal for my vegetarian god daughter. The salad filling can be served all on its own as a salad; I added a bunch of cherry tomatoes halved to it and it was ready to go. So simple but the combination of fresh lemon juice, lemon zest, red wine vinegar and EVOL makes a great salad dressing. If your filling seems wet; you added too much dressing. Add more tomatoes and diced zuke and cuke. Do not cook the zucchini – if it is fresh and tender it is fantastic raw in a salad. If you can’t get one of those European cucumbers use a small regular one and peel the skin off it before dicing. If the seeds are large do not use the center with the seeds. Your salad will not be as pretty if there are sloppy cucumber seeds in it. I do cut the veggies larger for a salad; diced is fine. But I suggest you keep the red onion bits very fine. And start with a fresh red onion. Onion does not keep well; gets bitter so peel a new onion to make your salad if you want the best tasting results. 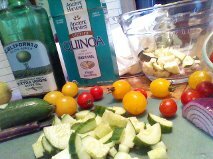 Quinoa salad will keep a few days in the fridge, if it lasts that long! Try it with different fresh herbs. I would never make this in the dead of winter as it just won’t taste the same without the fresh summer veggies. I try to eat seasonally and this is definitely a summer treat!